Philly has covered just three road games this season but another road trend is in play on Wednesday. The Raptors (20-5 SU, 12-13 ATS) had their eight-game winning streak ended by the Nuggets on Monday as 7-point favorites and are in for another tough home game on Wednesday. 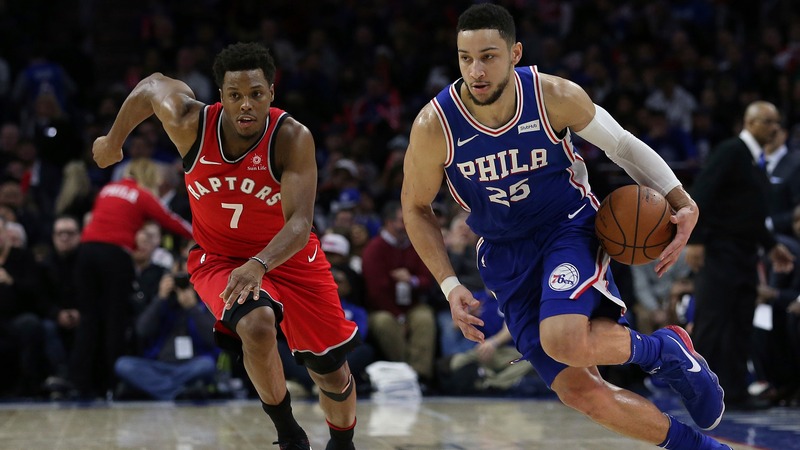 The rejuvenated 76ers (17-8, 11-14 ATS) come to Canada as 6-point underdogs [as they look](https://www.nba.com/sixers/?tmd=1) to continue their winning ways since acquiring Jimmy Butler and avenge a 129-112 loss in Toronto on Oct. 30. The 76ers are 8-2 straight up (5-5 ATS) since trading for Butler but their road woes have continued -- at least against the number. Philly has covered just three road games this season but another road trend is in play on Wednesday -- OVER 229. The OVER is 31-19 in 76ers and Raptors games combined this season and each team has great trends to support another OVER. OVER is 8-1 in 76ers' last nine road games vs. a team with a winning home record and is 13-3 in Raptors' last 16 home games vs. a team with a losing road record. OVER is also 5-1 in the last six meetings between the Atlantic Division rivals. __MORE:__ [Bulls fans and fantasy owners will need patience as Lauri Markkanen returns](https://www.betchicago.com/lauri-markkanen-return-bulls-fansfantasy-owners-patience) ### 76ers at Raptors odds, lines, trends 7:05 p.m. __Point spread:__ Raptors -6 __Total:__ 229 __Moneyline:__ 76ers +215, Raptors -265 __Betting trends:__ Raptors are 10-1 ATS vs. division opponents. Toronto is on a 10-3 first-half ATS run at home. 76ers are 1-7 ATS in their last eight road games vs. a team with a home winning percentage of greater than .600. __MORE:__ [Odds to win 2018-19 NBA championship](https://www.betchicago.com/nba-odds-championship-2018-19-raptors-rockets) ## Wednesday NBA betting lines, odds for December 5 *Odds courtesy of Westgate LV SuperBook; All times Central ### Warriors at Cavaliers odds, lines, trends 6:05 p.m. __Point spread:__ Warriors -11.5 __Total:__ 220.5 __Moneyline:__ Warriors -900, Cavs +600 __Betting trend:__ Warriors are 1-11 ATS in the first quarter their last 12 games. ### Nuggets at Magic odds, lines, trends 6:05 p.m. __Point spread:__ Nuggets -5 __Total:__ 207 __Moneyline:__ Nuggets -220, Magic +180 __Betting trend:__ UNDER is 8-2-1 in Nuggets' [last 11 road games](http://www.espn.com/nba/team/schedule/_/name/den) and is 5-0 in Orlando's last five home games vs. a team with a winning road record. ### Wizards at Hawks odds, lines, trends 6:35 p.m. __Point spread:__ Wizards -5.5 __Total:__ 232.5 __Moneyline:__ Wizards -250, Hawks +200 __Betting trend:__ Wizards are just 2-13 first-half ATS last 15 games. ### Thunder at Nets odds, lines, trends 6:35 p.m. __Point spread:__ Thunder -7 __Total:__ 219.5 __Moneyline:__ Thunder -330, Nets +260 __Betting trend:__ Thunder are 7-1 ATS in their last eight vs. Eastern Conference. ### Hornets at Timberwolves odds, lines, trends 7:05 p.m. __Point spread:__ Timberwolves -5 __Total:__ 220.5 __Moneyline:__ Hornets +175, Wolves -210 __Betting trend:__ Hornets are 8-1 ATS as underdogs. ### Pistons at Bucks odds, lines, trends 7:05 p.m. __Point spread:__ Bucks -8.5 __Total:__ 229.5 __Moneyline:__ Pistons +275, Bucks -350 __Betting trend:__ Bucks are 0-5 ATS in their last five games overall. ### Mavericks at Pelicans odds, lines, trends 7:05 p.m. __Point spread:__ Pelicans -6.5 __Total:__ 227 __Moneyline:__ Mavericks +210, Pelicans -260 __Betting trend:__ Mavs are playing a back-to-back but are 8-2 ATS in their last 10 after scoring 100 points or more in their previous game. ### Clippers at Grizzlies odds, lines, trends 7:05 p.m. __Point spread:__ Grizzlies -2 __Total:__ 212.5 __Moneyline:__ Clippers +110, Grizzlies -130 __Betting trend:__ Grizzlies are a perfect 10-0 ATS in the first-half of home games. ### Spurs at Lakers odds, lines, trends 9:35 p.m. __Point spread:__ Lakers -8.5 __Total:__ 224.5 __Moneyline:__ Spurs +300, Lakers -400 __Betting trend:__ Spurs are 4-12 ATS in their last 16 road games vs. a team with a winning home record.